In ancient Egypt temples were conceived as the home of the gods, the most suitable place for worship. Temples contained wall reliefs from temples, steles, votive figures and liturgical instruments. The Egyptian temple was conceived as the home of the gods, a suitable place for worship. Through worship humans had to maintain the cosmic order, showing their appreciation for this order allowing them to inhabit the Earth. Originally, the pharaoh was the only being who could be considered akin to God but the laboriousness of rituals (which had to be performed daily) and the large number of temples in Egypt led to these tasks being delegated to priests. God had to be fed several times a day and was washed, dressed and purified, and chants and litanies were proferred by priests. The different areas of the temple constitute a metaphor for the universe and the process of creation. Starting in the profound sanctuary, small and made from wood, spaces become larger and better illuminated (avant-chamber, hypostyle, patio) until one reaches the exterior, where two monumental pile-ons mark the entry to the temple as symbols of the horizon where the sun rises and sets. 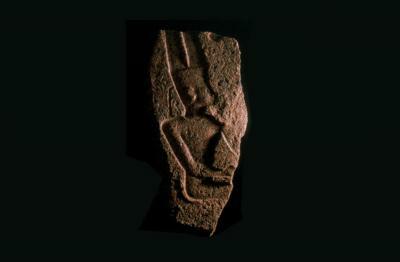 Wall relief with representation of the god Amon. Granite. The New Kingdom (1550-1070 B.C.). Amon was the god of the invisible, hence his pseudonym “the hidden one”. In this bas-relief he appears on the throne and his characteristic hairstyle, created by two large feathers, shines brightly. During the New and Middle Kingdoms, Amon was the god that gave the pharaonic state legitimacy, protecting the royal authority of the empire. 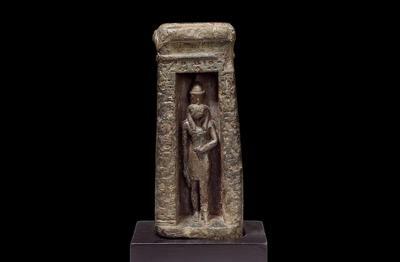 Statue of the person with a naos with the image of the god Osiris. Magnesite. 26th Dynasty (664-525 B.C.). Worshippers could also demonstrate their personal piety by donating private statues or divine images to temples. In this case, human statues in themselves represent the act of offering. 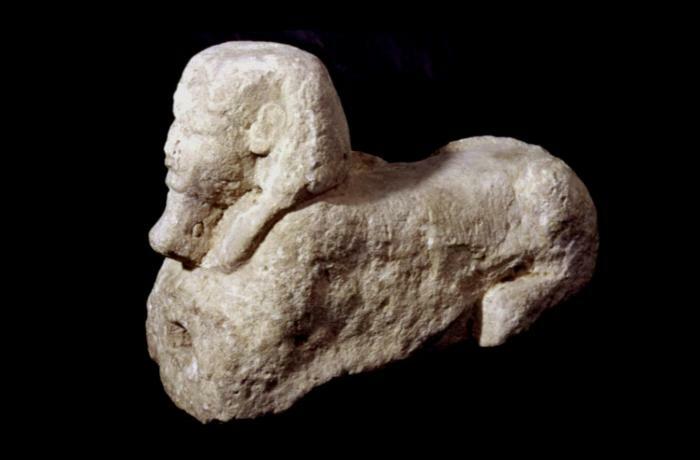 Representation of a pharaoh in the form of a sphinx. Limestone. The Ptolemaic Period (304-30 B.C.). The Egyptian sphinx could be interpreted as the result of the integration of two powers: strength and vigour (provided by the body of the lion) and divine or regal status (provided by the head of the pharaoh or of a divinity). This type of piece was used as an item of worship. Sistrum (reconstructed upper section). Bronze. Late Period (715-332 B.C.). Of the most popular musical instruments in ancient Egypt, special mention must be made of the sistrum. 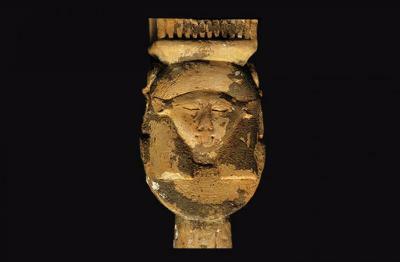 The sistrum was more than a musical instrument: it was mainly used at the liturgy of temples, in particular those dedicated to the goddess Hathor, since the sound of this instrument have her such great pleasure. With the subsequent assimilation of this goddess with Isis, the sistrum was also used in the liturgy of the latter and was used across the Mediterranean, just as Isis was worshipped across the Mediterranean. The crown of a ceremonial baton with a depiction of the god Bes i. Bronze. Late Period (715-332 B.C.). This piece was probably used to crown a baton that was part of the sacred furniture. 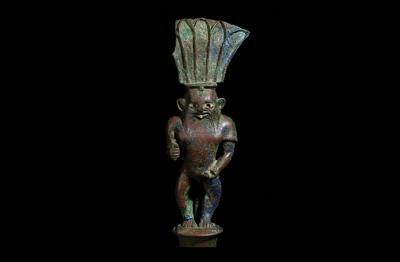 Bes was one of the most popular divinities in Egypt. Representations of Bes appear in contexts related to sexual activity. Bes was also considered a protector of women during childbirth, newborns and children.